Sometimes you want or need more than immune support, you need more from the immune system itself. Give it a push with Maitake Beta Glucan Extract. Clinical trials have shown that Maitake stimulates and enhances immune cells, pushing the body to its own defense. What’s in Maitake Beta Glucan Extract? The power of nature, with mushrooms known as supporting health. 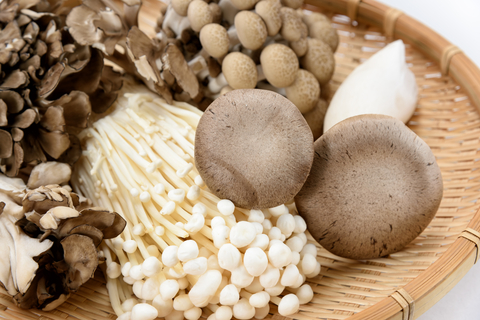 With Maitake, Reishi, Shiitake, and Agaricus mushrooms, it harnesses a variety of mushrooms for maximum benefits. Used throughout Eastern medicine and cuisine, western science has validated some of the benefits of these mushrooms, showing they stimulate immune cell activity and enhance immune cell function. Continuing research may soon show more benefits or long-term effects. In addition to enhanced immunity, Eastern medicine believes these mushrooms can be used to balance the immune system against different diseases, and science may validate that soon. For instance, the hypoglycemic effect of the mushrooms may help the body with diabetes. Hard to cultivate, these rare and usually expensive mushrooms can provide daily or as needed immune system. While mushrooms can be a great part of your diet, you probably aren’t getting the variety of Maitake Beta Glucan Extract each day. Availability in stores can be difficult, and forget the dangers of foraging—a good mushroom from one region can look like a dangerous one from another. A supplement like Maitake Beta Glucan Extract makes it easy to get the benefits of mushrooms, especially if you’re feeling unwell already! Give Maitake Beta Glucan Extract a try, either as daily support or a push when you need it.